Pupils identify the species of a 'Joey' from data and graphs and then devise an appropriate nutrition regime from tables of data. The case study is an authentic context in the Australian Outback in which the pupils find a young orphaned kangaroo just twelve centimetres long and weighing sixty grams. 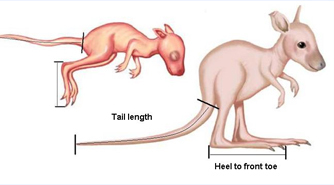 Different species of kangaroo have different nutrient needs at different stages of their growth. Through video clips, photographs and data such as birth to adult weights, pupils become familiar with a range of information about the different species of kangaroo. They then use the data to identify which kangaroo they have found and develop a feeding programme to save the life of their own 'Joey' in a simulation. Finally they communicate what they have learned in order to help someone else save a Joey by making a poster for a Vet clinic. The Assesment Guide for Save a Baby Kangaroo is comprehensive guide to help teachers to assess pupils' achievement and progression as they work on the activities. It includes sample work and progression charts. Key processes - identify the mathematics needed; put together chains of reasoning and use mathematical procedures in combination; use alternative representations of data; create convincing arguments from evidence; consider assumptions and the accuracy of results and communicate them effectively; reflect on their approaches and results. Number and algebra - use rational numbers and their properties and their different representations; rules of arithmetic applied to calculations and manipulation with rational numbers; application of ratio and proportion. Geometry and measure - points, lines and shapes in 2D coordinate system; units, compound measures and conversions. Statistics - presentation and analysis of grouped data; the handling data cycle. Curriculum opportunities - group discussion and communicating statistical and mathematical reasoning. There are four teacher-led activities and one pupil-led presentation lesson, each of one hour - although it is possible that some lessons will take longer than an hour. Each lesson is presented in two formats: as a detailed lesson format for those teachers unfamiliar with extended problem solving tasks and also as a lesson outline for more experienced teachers. A mixture of class, individual and group work is involved. The materials are appropriate for all pupils in Key Stage 3. Each lesson has a small homework task. Access to computers is highly desirable, but not absolutely necessary. This Case Study is presented as two interactive "browsers" - one for teachers, the other for pupils - containing all the instructions, lesson plans, resources and supplementary materials necessary to use the case study. As detailed Lessons Plans for teachers new to extended problem solving tasks. As Lesson Outlines for teachers with significant experience teaching extended problem solving tasks. A printable pupil record booklet contains the worksheets needed by pupils. Other resources include background information, videos and links to other websites. The browser can randomly choose a printable picture of a 'Joey' for each student to adopt, or these can be allocated by the teacher. Some lessons require a computer and data projector (or interactive whiteboard) to present the videos. Optionally, pupils may use computers to obtain information from the internet or to graph and present data using a spreadsheet. The case study can be browsed using Internet Explorer, Firefox or any web browser which supports "frames" and is suitable for PC or Mac. To enable pupils to access the browser, only the file Start_pupils.htm and the folder content_pupils need to be copied from the case studty folder to each machine or placed in a shared area on your network. Internet Explorer may warn about "Blocked Content" when running the browser-based version of the software from disc - users must choose to allow this. The case study can be browsed using Internet Explorer, Mozilla Firefox or any web browser which supports "frames" and should be "cross-platform". The video clips require Windows Media Player. Users of non-Windows machines may require extra software for this (such as VLC from http://www.videolan.org/vlc/). Materials will be needed to draw graphs and to display information on posters.